Thank you for choosing my apartment, I will respond to within 24 hours.! This apartment has been created by an Ancient Soap Factory in a building of 1400. The apartment is on the ground floor, it is VERY CHARMING and with MANY AMENITIES to make SPECIAL and COMFORTABLE your experience at the historical center of Rome. From here you can reach all tourist attractions on foot. The apartment is located on one of the most charming streets of the Artist's Quarter of TRASTEVERE. Here you will stay near all of the most important tourist points of interest. You can REACH ALL THIS POINT BY FEET. This area prohibits vehicular traffic, making it possible to walk till late at night between the alleys safely. I would like to emphasize that an excellent AIR CONDITIONING SISTEM, with AIR DEIONIZATION and PURIFICATION till 16 times per hour. Located, with easy access, on the ground floor of a very quiet street in the hearth of Trastevere. In the drawing room there is a HI FI system with jack for your smart-phone, so you can enjoy YOUR MUSIC at home. The KITCHEN is complete equipped and gifted of following domestic appliances: dishwasher, oven, stove, microwave, fridge, freezer, electric citrus fruit squeezer, coffee maker and all the accessories to cook. At the same floor you can found BATHROOM with shower. In the ante-bathroom there is a closet with a washing-machine inside. 1 bedroom (ARABIC ROOM) with a double bed and a double sofa bed in a slightly (but not completely). The heating is autonomous and allows management autonomous of the radiator and hot water. The style of the whole apartment is certainly a good fusion between Trastevere’s typical apartment and the comfort of the modern equipments. TRANSPORTATION FROM THE AIRPORT: We organize the transfer from the airport to the apartment for easy arrival and avoiding stress. PERSONAL CONCIERGE SERVICE: Upon arrival you will be met by Mrs Alessia who will provide you with keys, maps, and general orientation. Special requests can also be satisfied. Cleaning service can be arranged for an hourly rate. GUIDE SERVICE: Upon booking you may also arrange for a variety of tours with a private, English-speaking, authorized guide. A bathroom with shower, toilet bidet and washbasin. There is a huge difference between photos and real life. The flat in Via Garibaldi 24 is dark, shabby, noisy and leaves a lot to be desired in all respects. The sofa in the living room had a life of its own and tended to move beneath you if you sat on it. Turning the lights on and off proved to be an extreme sport. The corridor down to the bedrooms was low-ceilinged, so you were apt to bump your head (happened to me twice in 15 minutes). The shower could be much better, the beds were hard, the bedrooms had no daylight. Alessia, the host, was late, didn't take my three calls upon arrival and finally chose to send somebody else with the keys. Clara was late as well and, although I was by myself, charged the city tax as if there were two of us. I felt hugely disappointed, swindled even, so I moved to a fabulous hotel 30 yards from the flat on the same street (much cheaper as well). Luckily, I hadn't unpacked, so it was easy to leave. I let the owner know I had checked out after a 100 minutes stay, but he couldn't care less. I asked him to reimburse for the three nights I had paid for at the hotel (plus, of course, a new city tax) and I offered to show him the invoice. I even gave him the name of the hotel and suggested he look for my name in the register. It was right there, a few steps from his flat. He just couldn't be bothered. I gave him one week to reimburse but got no message from him. He's probably recounting his money. This is by far the worst experience I had over the last 13 years. I have travelled to many cities in Europe but never have had such an unpleasant experience. You'd be well advised to stay away from this place. What you see on the website is deeply deceptive. Also it is way too expensive for what it delivers. As for the owner, this is not the way to deal with your customers. I say it once again: I felt cheated, swindled and treated with the utmost disrespect. The lowest of the grades for this. Mr. Bucharest was contacted several times before his arrival in Rome. We asked him about the time of his arrival and he never answered. When he arrived at the apartment he started making nervous phone calls asking to be able to enter immediately. We arrived at check-in after about 20 minutes and this made him incredibly nervous. We have the obligation to take the Tourist tax for the number of people written on the booking form but he wanted to pay only for himself. The value of the tourist tax is 3.5 euros per person per day. This payment unnerved him in an exaggerated way. From that moment everything he saw was not good until he decided to leave. We asked him several times to cancel his reservation so that we could return the money and we would have had the opportunity to rent the apartment to other people but he did not. He only sent the invoice for the rental of a room asking us to pay his room ignoring all the dynamics and obligations that are linked to a confirmed reservation. I believe that Mr. Bucharest was deeply nervous because for some reason, I don't know, he would like to make this trip with some one and instead he did it alone. This was a great place to stay and was perfectly positioned near good restaurants and metro stops. The bedrooms were wonderful and quiet, though the upstairs was a little loud and one of the windows in the kitchen didn't close. There is also some confusing information about where the trash goes when you need to take it out, so that is something to clarify with the agent that shows you into the apartment. Great accommodations in precious neighborhood! My husband, my sister and I stayed for three February nights at this property. All of the interactions between the host(s) and I from check-in to airport drop off went seamlessly. The property was spacious, (although I think any more than 6 adults could be tight). We used the kitchen for 3 meals, it was user-friendly with a gas stove, microwave, full size refrigerator. THERE IS NOT A WASHER/DRYER. A washer/dryer was advertised when we booked, but there wasn’t one in the home. Just a few door fronts up the street is a laundromat and for 13 euro we had a medium- sized load, washed, dryed and folded. The WiFi only works on the main level, not at all in the bedrooms downstairs. Not a big deal for us, as we were only sleeping down there. The neighborhood is absolutely adorable and any time spent exploring and wandering the area would be time well spent! There are wonderful restaurants, bars, cafes and shops that are full of charm and character. Overall, our memories of Rome will be fond ones and that is in part to our comfortable and safe home. Great Location, close to resturants and attractions. Will highly recommend. AC/Heater available. This is not an easy review - in some ways the apartment is exactly what was promised, in some ways it's not. Also, the host was responsive to texts with questions/problems, but I was left to fix things on my own. So I could easily see another person with the exact same experience writing a 5-star or a 1-star. I love the location. A bit off the main shopping/eating alley in Trastavere. Probably my favorite location in Rome. Also, the apartment offers a lot of room for the price. Though only 2 real bedrooms, there are also 2 pull-out couches and a 3rd bed in an alcove. All rooms are of decent size, decorating is nice, beds are comfy. Kitchen, though small, is fine for cooking small meals, breakfasts, snacks. The listing pics are optimistic. The interiors are not as light as it appears, and the furniture is not as nice as in the pics. The bedrooms are underground. I knew this b/c of the reviews, but it's nowhere in the listing. This is good for quiet sleeping, but some may find the cave-like atmosphere unappealing. It is also musty, hence the air cleaning system. The description of "no vehicles" is wrong. No wifi upstairs. Kitchen appointments broken or of extremely poor quality. Furniture in very sad repair compared to pics. Some spots glistening clean while others very dirty. Shower curtain is disgusting. Shower head is crusted with calcium. Temperamental water heater. No laundry. Overall, it's a good place, but with a little care and cash it could be amazing. It is centrally located, so you can walk to almost anywhere in 30 minutes. The welcome basket was great and Alyssa very nice. 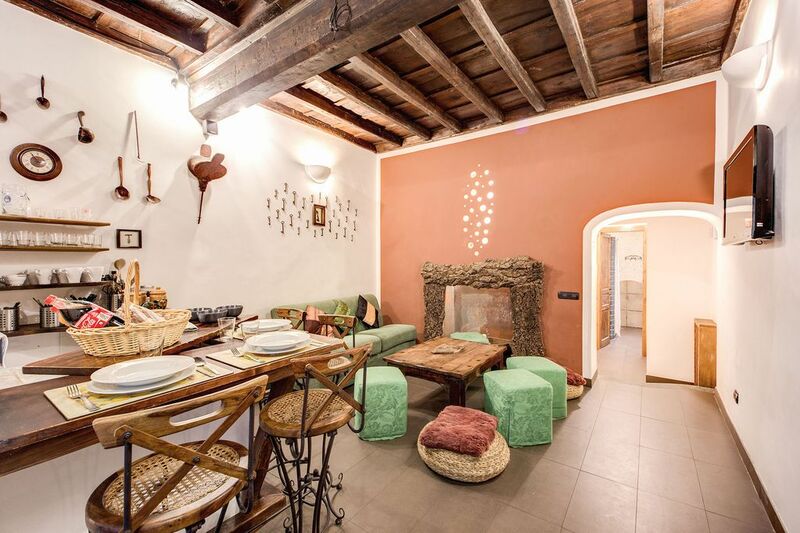 The apartment is located in one of the most charming streets of the artistic neighborhood of Trastevere. Guests will stay close to all major tourist attractions. You can reach ALL MAJOR POINTS OF INTEREST ON FOOT. This area is closed to vehicular traffic, it allows you to walk until late at night in the narrow streets without any danger. This apartment is located in Via Garibaldi a very quiet street and rich in the heart of Rome's liveliest. The entire neighborhood is full of shops, restaurants, pubs and pizzeria, which makes the perfect area to go out at any time of day or night. Trastevere seems to have a special magnet that attracts people from all over the world, and is the favorite Roman Quarter for artists, musicians, actors and people who seek something new. Its colorful personality never leaves you indifferent. As for public transport, walking distance from home, you can take a small electric buses to run all the historical center.